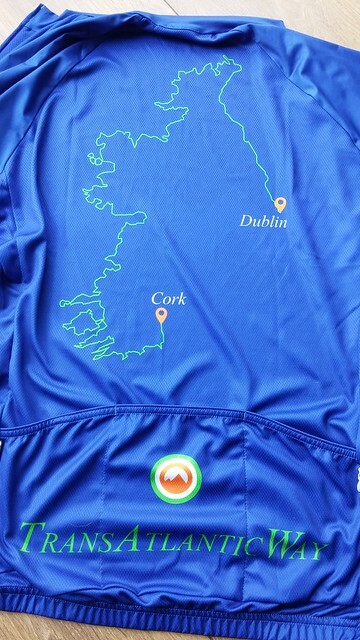 Unsupported racing round Ireland, Oh that will be a lot easier than racing across Europe, flatter, common language, plentiful food……wrong wrong wrong! The TansAtlanticWay Race thanks to the brilliance of organiser Adrian O’sullivan appeared on the calendar for 2016. Rather than a glowing report on the beauty of this route, this is more of a memory dump for me to look back on as mine fades. If your expecting flowery prose then this is not the place for you, if you’d like an insight into an unsupported race week, enjoy. Dublin why would you start a race in a busy city centre, it was great to visit, and easy to reach via train and ferry but it did make for a few extra challenges to the organisers. The accommodation at the Trinity College was superb though, and the 10pm (‘ish) start was nice and relaxed with plenty of time for racers to get together. Adrian had commissioned a nice race jersey, which I was proud to wear. 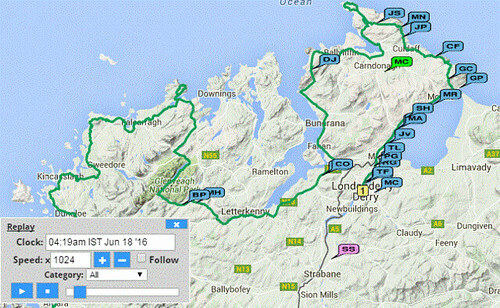 The start rolled out North with almost all riders choosing the direct A2 main road to CP1 in Derry. At the race meeting it was questioned that riders would find it hard not to ride at the same pace and from those comments drafting was allowed on day 1 only. 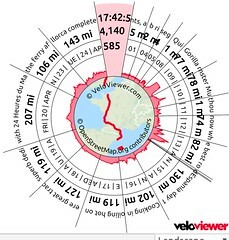 I considered this a very selfish suggestion from those that made it, with the subsequent all day headwind it transpired that groups of riders abused this privilege. Latching on to faster riders, pushing yourself too fast to soon, some almost scared not to stop in case they lost the tow, all well outside the self regulated code of unsupported riding. Once outside the confines of the busy Dublin streets I deliberately dropped back to ride solo at all times, and got quite agitated seeing riders chase down faster riders for a tow…..can’t help ride at the same speed hey! Replay the TRACKER of the event and judge yourself, boy that Bernd Paul (BP) is a machine look at him go! 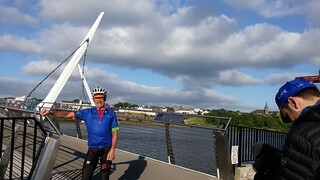 BP was first to the Peace bridge in Derry, closely followed by Mike Henley (MH) who I’d spent the ferry crossing over with, sounding very fast. next up was Ciaran O’Hara and Adrian O’Sullivan, two riders who I knew had the speed and experience to push this to the limits. Ciaran’s relatives met us in Derry with very welcome Sandwiches and bottle top ups. Amazingly for me I was next up in 5th, this was not what my brain wanted to hear, I didn’t want to be in a race just yet, so time to chill and do some posing for the camera crew and waiting for John to arrive to say hello. 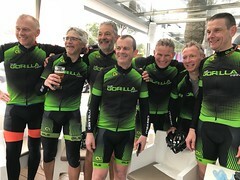 Now John is a powerful rider on the flat, not my strength, I didn’t expect to be with him and considering I had gone against all my steady pacing plans. It was 8pm, I had no hesitation in diving into a Mc’Donalds to stock up for the long evening as we headed for the quiet NW corner. Also there was birthday boy Adrian, resplendent in full TAW race kit, stuffing himself while face-timing the family who were cruelly teasing him with views of his nice birthday cake. 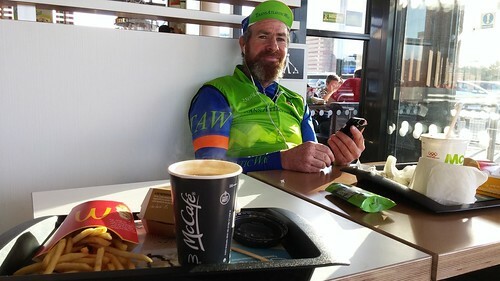 At this stage Adrian was committing to riding through the night due to the late start, stuffing his pockets with cold burgers. Watching him go I layered on all my kit and set off in search of Muff and some beautifull late evening coastal views of the bay; here I was caught by iconic event photographer Matthias Wjst (Doh! that shot never made the cut –his photos here) just as I caught Paula on the road again. We chatted and rode together, no drafting, for some time until……Kapow! A left turn and the road grew narrow and steep, and it was taking no prisoners. 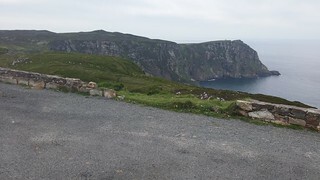 This was no kick in the teeth route addition from Adrian, it was proper signposted WAW, hello to the Kinnego Bay climb 10% for 2 miles. 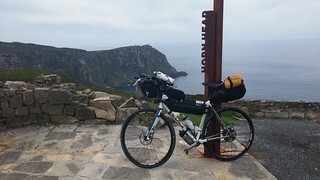 Dropping to the small ring and spinning easily, I left Paula behind keeping my mind off the pain and shock of the severity of the climb, thinking of how some riders will be suffering painful legs/backs or even walking this already. 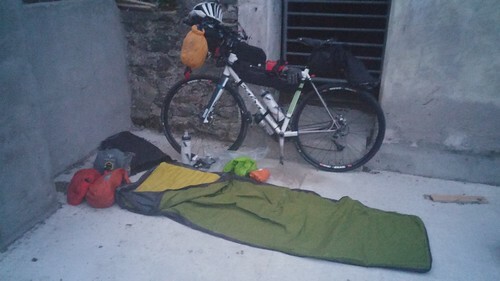 Day 1 had been tough enough already despite it still being light and only riding for 13 hrs, at 176 miles I called it a day, finding a nice clean piece of concrete to bivy out under the stars for an early start. Already behind my plan, I tried not to feel dejected knowing that the wind had sapped a lot of strength from me, content I had stayed true to the solo riding ideal. That concrete was so new I’m sure it was still giving out warmth as it hardened. For anyone interested, I had my Neoair full mat and silk liner pre-rolled in my seat pack. After a good recovery feast, throw it down, wet wipe wash, and sleep on a pillow of rolled up clothes in a dry bag. Race News: As I slept Daniel Johansson, Michal Novak, Paula and John all passed while the four top guys ploughed on past Letterkenny non stop as dawn broke. Strava (recorded by a faultless Garmin 1000) tells me I got rolling at 4:23 so a lazy first night, needed though, as the route kicked in early with another tough climb. 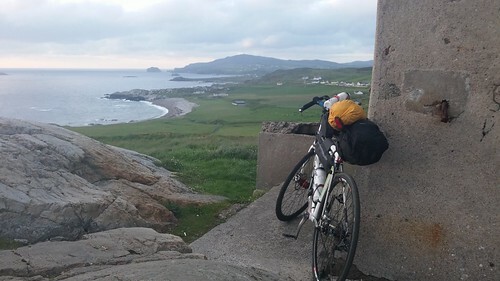 Pretty soon I spotted Paula packing up from her doorway bivy, and from the tracker missed John by seconds as he completed the out and back Malin Head loop. 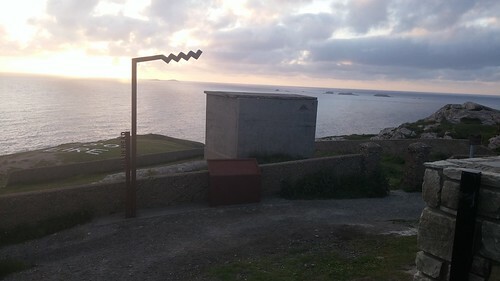 Malin Head the most Northerly point of Ireland had a sting as you were required to climb up to the point end tower as a route diversion. This illustrates the honour of the code of unsupported races, it would be so easy to miss this stinging climb and go unnoticed, but who are you cheating. The views were outstanding as Ireland slept. I like the possible idea of photo checkpoints, make riders take in the sights, not just pass through. 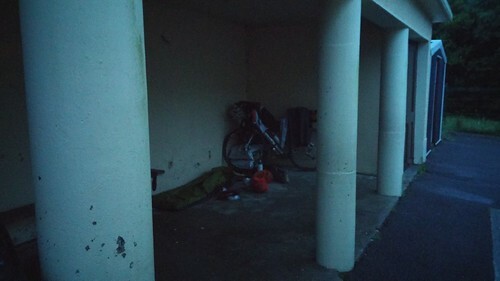 You could in fact have a beautiful bivy here in a deserted clean concrete building, one to target for future racers perhaps. 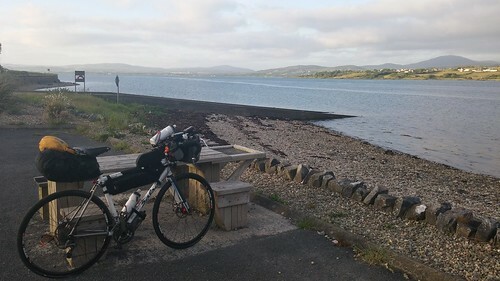 Sleepy NW Ireland, you won’t find the bustle of a nation waking to go to work out here, one of the realisations of this event is that early starts mean up to five hours of riding before finding hot food and coffee. luckily I had plenty of food in stock and could not resist stopping for an alfresco breakfast to soak in some stunning coastal views. Wondering if any riders would be close I resisted the urge to fire up the tracker, no race thoughts please enjoy the moment, as I knew more pain was coming soon. 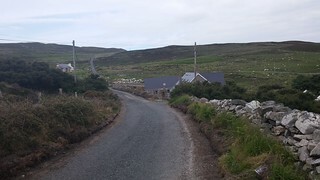 The Mamore Gap over a mile at 15% was going to stress the legs soon enough. Seeing this looming in the distance woke me up, the Northern approach is tight and twisty, while the southern side is one fast long straight blast down. The more pressing morning issue of getting water was solved when a house side tap came to the rescue. Sweating for the first time on this ride, this was tough, looking back Michal Novak started this as I finished but now all I could think about was a morning stop. 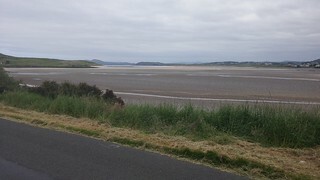 Buncrana came to the rescue, a great café attatched to the supermarket was a great spot. 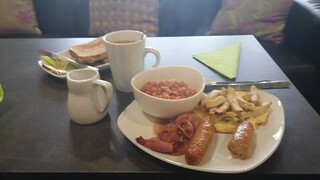 A superb breakfast including a good omelette loaded with extra chicken, and great coffee was long overdue. Comfy sofas, a wash room clean completed the requirements to set me up for a full hard day. Unfortunately just as I was leaving Paula appeared, it would have been nice to share a coffee and a longer chat, it appears even at this early stage I have found the race shadow person, the one you constantly cross paths with. Getting round Letterkenny was a blur of traffic in the area for the Donegal rally, long wide sections of road all painted with rally boy donuts, they were everywhere. 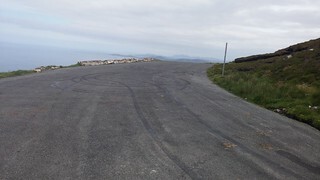 Occasional shouts from drivers replacing burnt out tyres adding to the smell of burnt rubber. 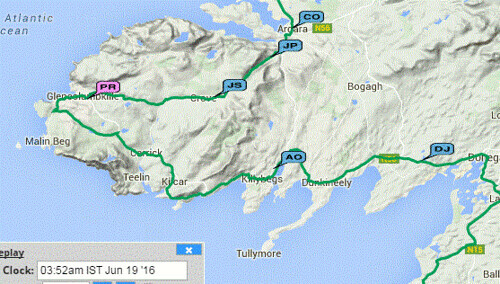 Because of the weekends rally the route diverted away from the WAW route up and up into the Glenveagh National park. It was a long steady climb up to 600ft, it was the first sight of an open moorland environment, and as my mind wandered I questioned why I was doing this. I like distractions but here I had to much time to think and feel the pain of a long featureless drag into the wind. Pretty soon my mind was focused, as I turned into the much discussed gravel section. 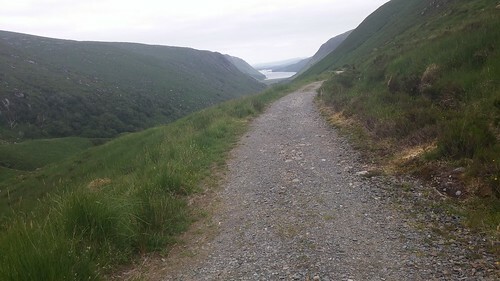 The view of the Lough Veagh was glorious, but hang on that’s a long way down, 400ft it turns out and it was technical lumpy and MTB fun, oh yes we like this, crazy skinny tyre action. Luckily the section alongside the waters edge was smooth enough not to drag for the length, I stopped amongst the walkers took photo’s and drunk in the beauty of this location. 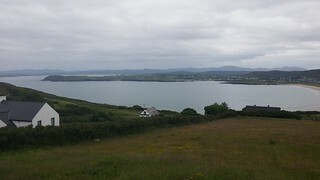 Back up to the coast for another loop overlooking Sheephaven bay, another killer climb, this route is nothing but brutal. A blur of gear changes, up the block, front ring change down the block and repeat. 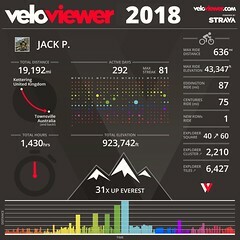 For my local friends its like riding a double Gorilla 100 miler in the Rutland hills, with at least four Rockingham hills per day thrown in, body killers. 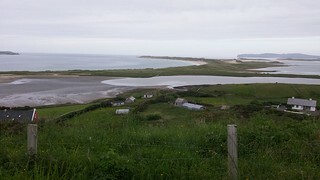 Coastal Ireland is a cycling assault course. The rest of the day was a blur; pretty single white holiday cottages dotted along tens of miles of great coast line, the drizzle came. 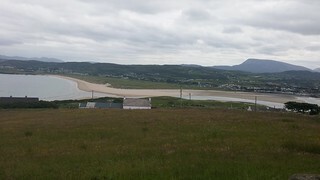 Ireland migrated to pubs to hope their team could stay in the Euro Champs, I plodded on battered by the elements hoping to hit my daily target. 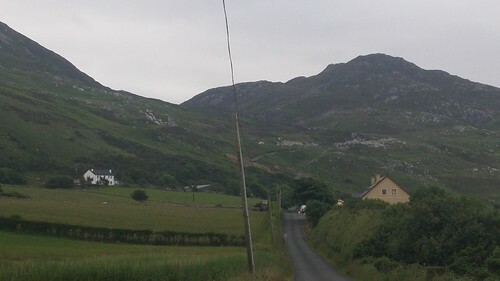 Somewhere around Ardara I stocked up for the night as a shop threw me out, it was 10pm and unknown to me at the time I had caught up with John. Leaving the N56 behind the rain was heavy with howling winds, I spotted a great covered bin store at a school and ducked for night cover. Pure bliss, dry cover, even a bench for my recovery feast and it even had a tap, sure struck gold there. Despite another shorter than target day I was relived with this lucky find after 18 hrs on the road and 184 miles for the day. Race News: BP still riding into the night narrowly leads a brief resting MH. 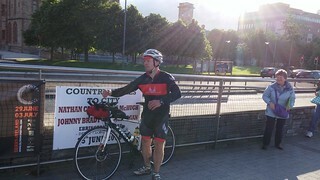 Ciaran rested early and was soon to scratch with hand problems no doubt exaggerated by the endless gear shifting. Daniel gets going at 1am on Day 3 and passes Adrian. Paula finally gets a new tracker and pops up having passed me and John as we sleep.